Wolf-Gordon is a leading American design company that provides wallcovering, upholstery, drapery textiles, and paint-to-contract interiors. For the past seven years, karlssonwilker and Wolf-Gordon have developed a relationship based on design-driven creative, culminating in a series of installations for NeoCon in Chicago, the largest commercial interiors show in North America. Each year, we collaborate closely with Wolf-Gordon’s creative team to design and develop large-scale, three-dimensional sculptures that represent the brand in new ways while ensuring on-point brand messaging throughout its trade show presence and general advertising. This is done while simultaneously highlighting the many-fold fabrics and materials they offer. karlssonwilker also took on the design of the brand’s advertising campaign which showcases the creative process behind designing and building the installations. The campaign is fully integrated with elements in print and social media, and further educates the consumer about the wide array of design-conscious options Wolf-Gordon has to offer. Folio celebrates Wolf-Gordon’s 50th Anniversary via a display of its commercial wallcovering and upholstery partnerships with leading international designers, as well as its recently published monograph, Wolf-Gordon: Sample Book. Arrayed in consistent rows, it displays each of the book’s 150+ spreads. Wolf-Gordon’s annual communication campaign centers on the design process of their installation. Each stage of the project is revealed in real-time, underscoring the respective creative process. 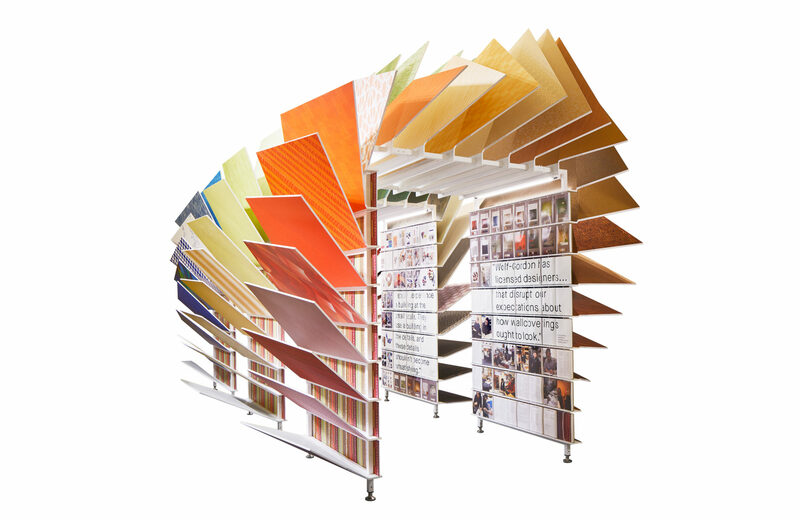 Visuals evolve from simple sketches of the nascent project to 3-D renderings, and once the project is installed at NeoCon, the campaign uses actual photography. As in previous years, Wolf-Gordon’s thoughts are unveiled throughout the year in an advertising campaign that begins with sketches and ideas, and ends when the year’s work which is unveiled at NeoCon. The 2016 piece, Excavate, came partially from Wolf-Gordon’s own move from Long Island City in Queens to Manhattan. It’s an interpretation of the evolution of the office—an erosion of the office grid that is transformed into a lounge-like collaborative environment. Different postures like lounging, sitting, or perching are possible using the grotto and fabric covered forms around it. A long screen with thousands of LEDs are suspended over an escalator bank. At the bottom of the escalator, you can see an image of yourself displayed in the LEDs. As you travel up the escalator, your image becomes more and more deconstructed into abstract fields of color. Measuring 26’ long, over 12’ wide, and 14’6” high, the 1,300-pound sculpture is suspended from a gridded truss that is rigged to the building’s massive load bearing structure. Appearing as an assemblage of sculptural ribbons, Ribbon Cloud is covered in 144 pieces of wall-covering and upholstery textiles, arranged as an array of the color spectrum. Twelve individual ribbons wind through the space, twisting and folding, to give show attendees a dynamic visual and spatial experience. Resembling a twisted spine that gives a sense of movement through color and form, this installation is nearly 30’ long and 14’ wide. It showcases 136 of Wolf-Gordon’s products, one on each side. As visitors ascend the escalator, the slats appear above them like a twisting array of fanned-out cards. The products were arranged by color, forming a gradient that goes from white to orange to red on the way up the escalator and purple to brown on the way down. The edge of each slat slopes one degree, adding to the sculpture’s twisting vortex appearance. The slats are made from foam sandwiched between two sheets of Masonite. An aluminum channel along the perimeter of each slat provides rigidity. Identical plywood boxes connect and space each slat. Installed at the Merchandise Mart’s “town square” ahead of the annual NeoCon in Chicago, this 1,380-pound sculpture is composed of over 250 sides covered in over 500 yards of various Wolf-Gordon upholstery textiles, mirrors, and wallcoverings. NeoCon attracts 40,000 attendees each year, and features some 700 exhibits, occupying 1 million square-feet of exhibition space spanning 10 floors of Chicago’s Merchandise Mart.